You could make Exceptional White Chicken Enchiladas using turkey instead of chicken. Kentucky Style Hot Browns are a local favorite to my region. Turkey Pot Pie is the perfect comfort food – and an opportunity to use up some of your leftover Thanksgiving sides, too. Turkey Salad is a great way to feed a large crowd. You cannot go wrong with White Chili. Whatever you do with it, I pray that you enjoy the rest of the holiday weekend – and enjoy your leftovers! We’ll see you back here Monday morning with our Menu Monday, and Tuesday with the official launch of our Christmas Baking Attack Plan! It is funny to see your turkey in the Rival roaster. 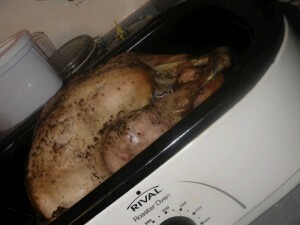 We put our turkey in our Rival roaster at 8 am and it was done by 9:30. Totally took us by surprise. I LOVE my Rival. I cook roast beef in it as well.